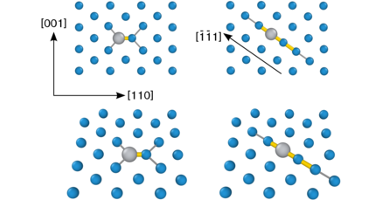 High-temperature, high-dose, neutron irradiation of W results in the formation of Re-rich clusters at concentrations one order of magnitude lower than the thermodynamic solubility limit. 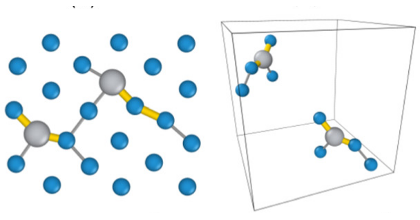 These clusters may eventually transform into brittle W-Re intermetallic phases, which can lead to high levels of hardening and thermal conductivity losses. 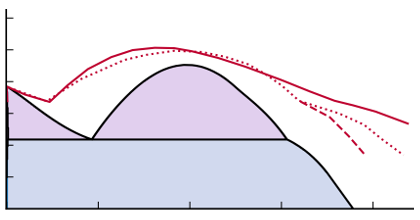 Standard theories of radiation enhanced diffusion and precipitation cannot explain the formation of these precipitates and so understanding the mechanism by which nonequilibrium clusters form under irradiation is crucial to predict materials degradation and devise mitigation strategies. 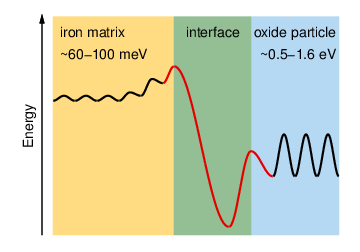 Here we carry out a thermodynamic study of W-Re alloys and conduct kinetic Monte Carlo simulations of Re cluster formation in irradiated W-2Re alloys using a generalized Hamiltonian for crystals containing point defects parameterized entirely with electronic structure calculations. 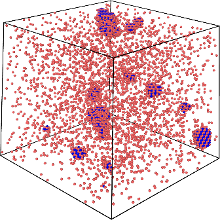 Our model incorporates recently-gained mechanistic information of mixed-interstitial solute transport, which is seen to control cluster nucleation and growth by forming quasi-spherical nuclei after an average incubation time of 20 s at 1800 K. These nuclei are seen to grow by attracting more mixed interstitials bringing solute atoms, which in turns attracts vacancies leading to recombination and solute agglomeration. The clusters grow to a maximum size of approximately 4-nm radius, and are not fully dense with Re, containing 50% or less near the center. Our simulations are in reasonable agreement with recent atom probe examinations of ion irradiated W-2Re systems at 773 K.